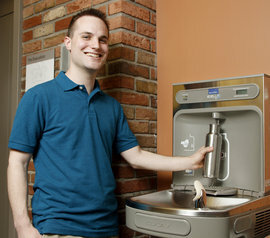 Leonard Slutsky '14 uses one of the water bottle filling stations his organization had installed across campus. As the founder of the student organization IC Take Back the Tap, I wanted to reduce the number of plastic water bottles being used on campus, so last spring I worked with event planners to offer the Water Monster, a container that holds the equivalent of 1,000 water bottles and filters water from a hose. Students used compostable cups, and we kept at least 300 plastic water bottles out of the waste stream. A lot of time and hard work led up to that success. My quest to change the culture on campus started when I visited Ithaca as a high school student and was dazzled by the inspiring views of Cayuga Lake. I saw that Professor Mara Alper was offering an online class named Water = Life. I reached out to her, and she invited me to audit the class even before I had enrolled at IC. When I came to IC as a student, I was inspired by what I learned in class and launched a new student organization with some of my classmates that focused on reducing the use of bottled water. IC Take Back the Tap worked with campus partners to find ways to reduce the number of single-use water bottles being discarded on campus. In addition to our success at the IC Kicks Back event, we succeeded in getting water bottle filling stations installed across campus. These make it easy to fill up a reusable water bottle with chilled, filtered water. It is estimated that more than 300,000 water bottles have been saved from being discarded. After cofounding Take Back the Tap, I joined the Office of Student Engagement and Multicultural Affairs as a student leadership consultant (SLC) to help other student leaders learn how to plan events, request money from the Student Government Association, and understand campus policies. I got to help Emily Quinn ’16, who founded the Adoption Support and Awareness Alliance, and I also worked with Katelyn Gualtieri ’16, who is the copresident of IC Courage, which plans monthly fundraisers to send kids who have been affected by cancer or other life challenges to summer camp free of charge. But you don’t have to start your own organization to become a leader on campus. You can join one of more than 150 existing ones. If you’re interested in community service, academics, performing, professional organizations, or social clubs, IC has options to choose from. One way to learn about the organizations is through the OrgSync portal, an online directory of student organizations, events, and contact information. There are leadership opportunities in almost every student group. Many student leaders start out as members. Some groups, like the Student Government Association, hold elections to select their executive boards, while other groups, such as the Student Activities Board, have an application process. There are also groups that have a general membership, with students serving in leadership capacities as committee chairs and event planners. After Ithaca, I plan to work in advertising strategy. In my internship experiences so far, agencies are looking for people who can work with others, be persuasive, and persevere. I’ve strengthened all of these skills through my work as a student leader.